Local man Abraham Sturley's debts are spiralling - and friend Richard Quiney believes William Shakespeare could be just the man to help. The playwright is prospering in drama and business - enough to be ranked amongst the gentry in the recent survey of corn and malt. 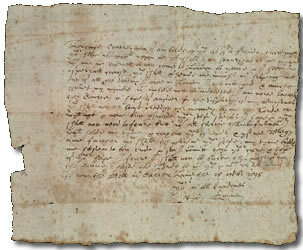 Quiney - who is in London on business - is believed to have requested Shakespeare's help. A recent letter details Quiney's request to Shakespeare for a loan of £30 (£3,155) - enough to buy a small house in Stratford.